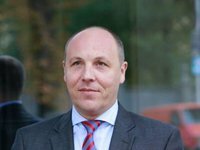 Verkhovna Rada Chairman Andriy Parubiy has called on the European Parliament at a meeting with President of the European Parliament Antonio Tajani to strengthen sanctions against Russia, as well as to extend their validity up to one year. "The Chairman of the Verkhovna Rada of Ukraine called on the European Parliament not only to strengthen sanctions against the aggressor country - the Russian Federation, but also to extend their validity up to one year," the website of the Ukrainian parliament reported. In addition, the speaker called on the European Parliament to adopt a resolution condemning the construction of the Nord Stream 2 gas pipeline. Parubiy also informed the President of the European Parliament that Ukraine had begun the process of consolidating the obligation to join the EU and NATO in its Constitution. Tajani called it an important step on the path of Ukrainian integration. We welcome the course of Ukraine to gain membership in the European Union. We are waiting for you in the European Union, the Verkhovna Rada press service quoted him. As is known, on Tuesday, Parubiy is on a working visit to Brussels, where, in addition to meeting with Tajani, he also has talks with NATO Secretary General Jens Stoltenberg.